We've had some simpler lunches again the last few weeks. The husband was away on a training mission for a month, so there was a lot of streamlining the process with there only being one driver at home. Lunch was made extra simple too! Egg salad is a favorite for the girl, so that was what I packed! We prefer just two boiled eggs, sliced twice on an egg slicer, and a big dollop of mayo. Super simple and tasty. I put that into a jumbo silicone cup that fits snugly under the box lid so it won't tip. 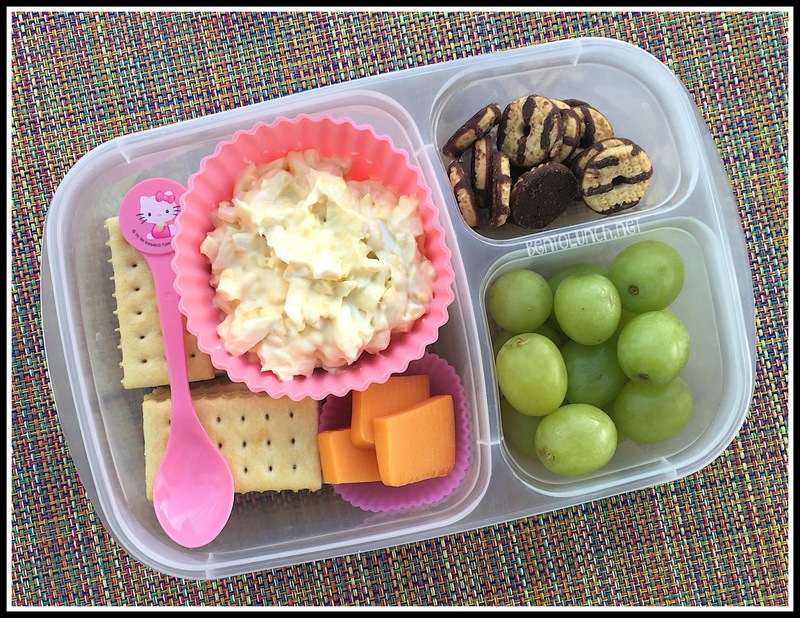 She prefers crackers with her egg salad, as opposed to a sandwich, so we added club crackers with a spoon for scooping and a few chunks of cheddar cheese. For sides, she picked mini Fudge Striped Cookies and some grapes. Unlike her brother, this is pretty much her entire lunch.